Shopify is a Canadian hosted eCommerce platform for simple and safe online shopping requirements. It not only provides platform but also hosting services. Starting an online web store has never been so easy for eCommerce solution providers. Shopify offers many ready-made templates and themes, that one can select from and publish the store within short time. In fraction of time, one can start running an online store without worrying about underlining technology and maintenance. There may be some additional requirements that a standard Shopify may not be offering. Shopify AppStore comes to rescue for such requirements. There are plenty of apps, free and paid both, that user can readily use without investing in customization and development. 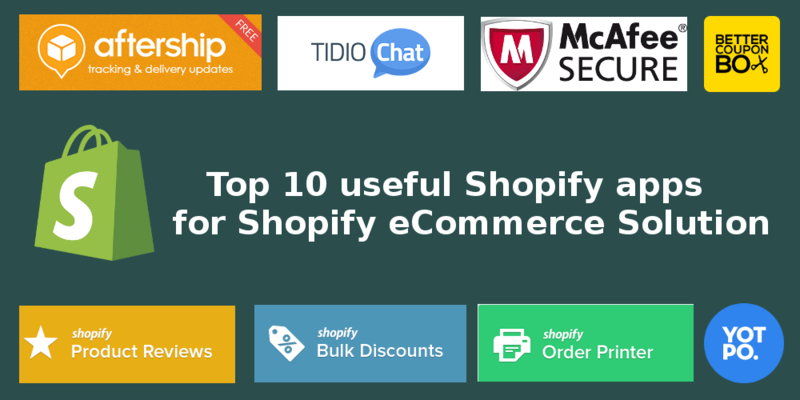 We discuss ten such Shopify app that are very useful to Shopify eCommerce Solution Providers. MailChimp is very popular as email marketing solution. MailChimp for Shopify is an easy app that connects Shopify online store to your MailChimp account. MailChimp is the developer and distributor of this Shopify app. At checkout process, Shopify store asks customer to get new updates by subscribing to email newsletter. MailChimp is very popular email marketing solution that targets email based on customer buying behaviour. It can turn customer sceptical about using their information and can make distance with your shop if it is overused. Omnisend is an ecommerce marketing automation platform that makes it easy for you to increase your sales through powerful features, such as automation, smart segmentation, live web tracking, SMS marketing, and much more. This will help you to increase your customer acquisition, engagement and retention--meaning better sales and happier customers. Order Printer Shopify app helps shop owner to print order details, invoice, labels, and bills. This Shopify app is developed and distributed by Shopify. Provides customer template support. One can create its own template using HTML. Yotpo is the smartest solution for rating and site reviews. Shop owners can share their site reviews in marketing tools like Google AdWords, Facebook, Facebook Ads, Twitter, Instagram etc. It is developed and distributed by Yotpo. Yotpo is a user generated content marketing solution company. This Shopify app is to add product reviews in product page with an aim to drive more targeted traffic to your website and product pages. This is free and offered by Shopify. Bulk Discounts allows creation of large no. of discount for your store and it also offers discount codes for groupon. It is developed and distributed by Shopify. AfterShip Shopify app is shipment tracking app for all shipments..AfterShip allows tracking the product till it is delivered. One can track all shipments in one place. This app is developed and distributed by AfterShip. This improves SEO of the website and helps driving natural and organic traffic to the website. Product images can easily be viewed in Google Image Search and helps in organic SEO. This is offered by Booster Apps. When visitors first time visit the store, Better Coupon Box displays a beautiful responsive coupon popup to convert visitors to email subscriber and social followers. This helps in marketing campaigns. This is developed and distributed by Beeketing. Tidio Live Chat increases interaction between client and shop owner. Customer seeking some information about your product can reach you instantly. Tidio provides live chat services. Tidio Ltd is the developer and distributor of this app. McAfee SECURE certificate provides trustmark for customer that they are safe in this store and they can order product and make transaction without worrying about the security. McAfee SECURE scans your site against viruses and malware. Shopify eCommerce platform is an easy and low maintenance eCommerce solution. Shopify apps add more features to the online store. This is just indicative list of few Shopify apps that help users to enhance their online store. Shopify eCommerce solution providers can refer this for during online web store development.